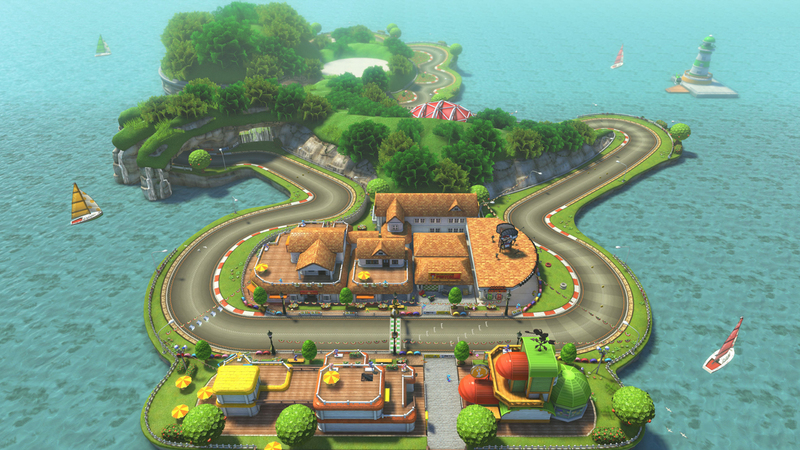 Mario Kart 8's first DLC is going to bring back a classic track from the series: Yoshi Circuit. This course and other content from the DLC pack were featured in a new trailer and screenshots released by Nintendo. Yoshi Circuit is an island track modeled after the character's silhouette. His "feet" feature straightaways where players can pick up some serious speed. The "tail" of the course is a hairpin turn that could doom a lot of inexperienced drivers. The constant curves at the "head" will require some skillful driving as well. This course first made its debut in Mario Kart: Double Dash!! for Nintendo GameCube. It was then resurrected for the Lightning Cup in Mario Kart DS. 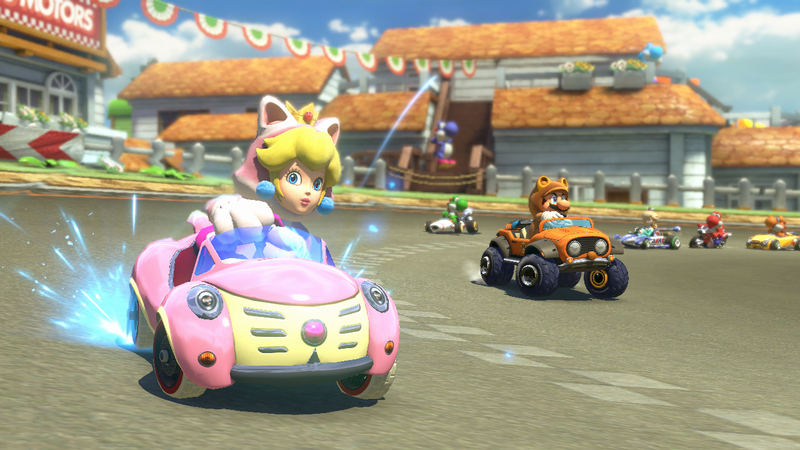 Nintendo hasn't changed the track too much for Mario Kart 8, save for a visual upgrade. The starting line is now surrounded by a small town. Sailboats and a lighthouse are visible while traveling the island. Yoshi Circuit is one of eight courses included in the DLC. The only other one confirmed so far is Wario's Gold Mine, returning from Mario Kart Wii. It's believed that some of the other tracks will take inspiration from other Nintendo classics F-Zero, Excitebike and Legend of Zelda. We've yet to see those courses yet, though. Three characters will be introduced with this add-on: Tanooki Mario, Cat Peach, and Link. Link will have a motorcycle adorned with shields. The front of the frame is shaped like the head of a horse, his traditional mode of transportation. 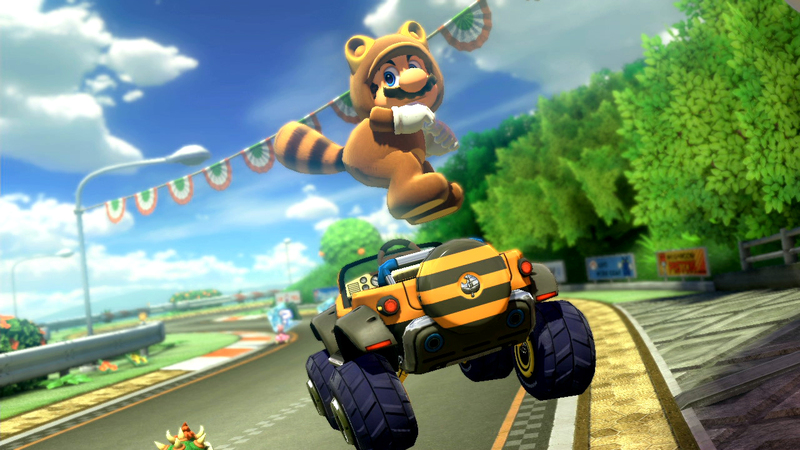 Tanooki Mario also has a matching ride, a buggy with orange and black stripes. The logo on the spare tire is a Power Leaf, the power-up that turns Mario into Tanooki Mario. The other two new vehicles include the Blue Falcon from F-Zero and Mario's B Dasher. The B Dasher is the skinny, white race car featured in MKDS and MK7. This DLC, dubbed "The Legend of Zelda × Mario Kart 8," is expected sometime in November. It's one of two add-ons planned for the kart-racing game.